The Liars Club: Nuts & Bolts at Nacoochee Bend Airs This Weekend! If you'll remember a few weeks back, we made a couple posts here at the Liars Club about Cefus McRae and crew filming an episode of Nuts & Bolts of Fishing & Boating at Nacoochee Bend. Well, it's airing beginning this weekend. Watch for it Sunday morning at 7:30 on FOX Sports Network - South, and again next Thursday at noon. Just click on the photo to see a preview Cefus has posted on his Facebook page. "Spring is in full swing and the big trout are feeding on both nymphs and dry flies. In this case, you'll see 7 to 8 pound trout taking flies as small as #18's. The underwater footage really gives anglers a lot of insight on where trout live and how they feed. 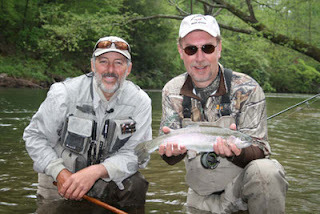 Rex offers tips for novice fly anglers on the equipment needed to get started fly fishing, and Jimmy shares his thoughts on the amazing trout fishery in north Georgia." "And remember, if you're already on the water when the show is airing, just set your DVR's to record them. There's lot of great information in each episode to help you become a better angler! " That's one of the great things about Nuts & Bolts of Fishing & Boating - they're not just about showing a bunch of trophy fights - they actually help educate the angling and boating public....check it out if you can!